Not necessarily for everyone, but you can't deny the quality. When I first reviewed Megazone 23 pt. III as one of my first amateur reviews, I said that I'd be certain to get the soundtrack, and here I am now with the review. Megazone 23 has always been one of my favourite classic mecha anime. Part III was always my favourite part too, for a few reasons, but probably because it had a really clever and original soundtrack--a great leap from the classic (and regretfully somewhat generic) '80s pop of part I and much more notable than the more low-key themes of part II. This soundtrack is indeed great, a sci-fi classic. The presentation of the CD is quite good. The cover has the same picture as the video box from the PAL release of the film, and while the booklet on the inside has no information or notes (apart from the credits) it does have some sweet artwork to look at. The CD itself is printed with a colourful picture of Eiji's Garland unit, one of my favourite mechs of all time, and looks great. Most of the music on the soundtrack was arranged and usually also composed by Keishi Urata. Although he's quite talented, he didn't do my personal favourite tracks--the three songs of the idol Eve. Kazuhiko Kato did music and arrangement on track 2, and Nobuyuki Shimizu did tracks 9 and 15 (see below). Tsuyoshi Kon also did track 3, a different style again and another of my favourites. Anju Mana and Yukinojo Mori also contributed lyrics to some songs and Chikaku Tsuchiya provided music for two of the later tracks. No, I don't know who any of these people are either, but despite this spread of talent and variety of music styles the soundtrack still remains constant and coherent with no tracks that sound like they belong in a different anime, and they're all pretty good, it at times a little abstract. Track 1, "Eden, the Last City" is quite different from almost anything I've ever heard in my life. A mysterious synthesizer mix, it's very hard to describe accurately except to say it sounds very cool. Not explosive as the opening tracks on many other anime soundtracks, but a sci-fi warm up, preparing you for the rest of the album. I can't recall hearing it in the movie, but that holds true for quite a few of the tracks on this CD. In any case, this doesn't lessen its cool effect. Track 2, "Sleepless Beauty in the Woods" is my favourite. This was the primary action theme from the movie used in the two key mecha action scenes at the half-way point and the end. With what sounds like an electric violin opening and main theme, followed by a steady synth rhythm and a catchy vocal line, accompanied by what almost sounds like an accordion, this track really gets the blood pumping. This was one of Eve's main songs in the film, making it somewhat equivalent to the songs of Sharon Apple in Macross Plus. I love it greatly and I bet you will too. The next track is great easy listening. "Eiji" (the main character's theme) is a futuristic synth mix with a light, airy melody overlaying a solid percussion rhythm. Although longer than most tracks at 6 minutes it doesn't go the whole length without changing and develops into a much more solid and satisfying theme. For those who've seen the film, it's the theme from the opening "Hard On" video game scene (I still smile at that name every time) and sounds even better on its own--a rare thing among anime soundtracks. It all comes down to a great fade-out which leaves you very satisfied. "Netjacker," on the other hand is a strange electric and bass guitar mixed with keyboard and synth--case you haven't already noticed, Megazone 23 pt. III was made when synth was very popular and boasts some of the best synth I've ever heard as a result. The beat is solid, almost rock and roll. It's definitely soundtrack music, but it's very good stuff. One thing that is strange about "Netjacker" is the way that it suddenly cuts off in mid-play at the end, going immediately into track 5--"Ryo." In the film, Ryo was Eiji's girlfriend and her theme starts out as a simply, airy singing pattern, modified with a little percussion and a high techno-chime accompaniment, with a little synth reminiscent of one of the later tracks. "G-Form" is action scene music, although I can't pick exactly which scene. A bass and bongo-drum rhythm accompanied by techno-orchestral bits, it also cuts out very quickly to go into the next track--"Artifact." Track 7 is a strange track. Very moody, with a constant computer-generated voice in the background interspersed with synth, bass and percussion, this was one of the film's primary mood tracks. The computerized--sounding vocals at the end of the first part are extremely eerie. But after this point, the entire track suddenly warms up. It becomes a breathy, almost wind-swept but enlightened synth-choral piece with a pacing quality that makes it seem almost not quite there. It could almost be a different track from the first, but "Artifact" is indeed a single 5:20 track, and there are enough similarities to make the change something more than arbitrary. Track 8 is different from all the other tracks on the album. "The Wall of Eden--Another Story of Megazone" is not a normal song, but a combination of monologue (spoken, I believe, by Eiji), some dialogue between the characters that wasn't from the actual film and bits of music. The monologue and dialogue were largely lost on me (who, despite my best efforts, had very little idea of what was being said) but they still at least sounded interesting and you could tell at least vaguely what was going on if you've seen the film. The music was okay too--a little standard, but this track was mainly about the spoken word. Still, towards the end after the speaking stops it really does get quite good, especially the guitar line. The track is really long at over 12 minutes, but it can be interesting to listen to a few times, especially if you're learning Japanese. Besides, you can always skip it. "Tragedy of an Idol" is another of Eve's themes. Most notably used as the ending theme, it has a great rhythm and some catchy lyrics, especially the chorus and its little saxophone twist. To my ear the opening chords sounded just a little off-key, but it's hardly a big problem and barely noticeable unless you're a musician. The piano line used in between verses was also very effective. Overall another one of the best tracks on the album. "Wang Dai" is a very grim piece, incorporating what sounds like a double bass, a very deep didgeridoo and some minor-key synthesizers. This piece is well made and I think it's good, but whether the common listener would find it "enjoyable" is a different matter--it does sound kind of depressing. Track 11, "Netpolice" creeps in with a deep opening which sounds slightly reminiscent of the previous track. The first half of the piece sounds quite artistic with shreds of chords and little riffs coming and going before the bass and percussion settles in. Even then, the piece sounds extremely "arty"--although I like that kind of thing, I don't know how many other people do. Eventually it settles down, but still sounds a little peculiar. Its length of 5:54 makes it the third longest track on the soundtrack, perhaps a little too long? "Bahamoud" is another one of the unusual pieces which characterize the second half of the OST. Based around a beat, it brings in and moves out different subtle themes in a moody manner which brings back a bit of the first part of "Artifact." It may seem a bit repetitive for some, but fortunately isn't too long. The start of "Cyberspace Force" sounds extremely... industrial before it settles down into a synth and piano melody--which swiftly changes back to industrial again. The style of the piece morphs throughout the song, though not drastically, making it very entertaining. This track has nifty back beat and some neat background support from the bass. It actually ends up sounding very much like something from a video game--almost Final Fantasy-ish. With "Project Heaven" the OST goes heavy/abstract again. With a metal/synth mix and some very unusual vocals it certainly isn't conventional music. These kind of tracks make up just less than half the album and really are a "love 'em or hate 'em" deal". I love 'em, but could see how other people might not. Then again, there's "Pandora's Boat" which is plain, simple nice music. The third of the Eve tracks, this is the "happy resolution" theme from the end of the movie and is nice, feel-good stuff. Much more conventional than the other abstract stuff that characterized this part of the album, it's good, simple music and I for one really like it. The singer's voice really is lovely. Finally, the OST closes with "Mother Earth." This track takes the album out on an abstract and, unfortunately, rather bleak note. 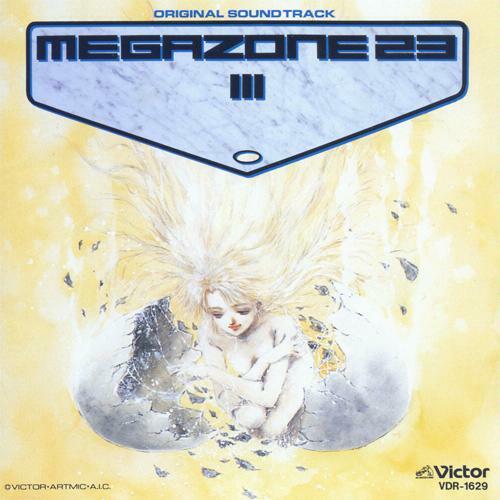 It's way too empty sounding when you consider that Megazone 23 had a happy ending--this track should have come earlier in the soundtrack, allowing it to end with "Pandora's Boat." It's not a terrible track, it just doesn't belong at the end. In all, what can I make of the Megazone 23 pt III OST? Well, I really love it--creative, classic, different and well executed, even if there is a slight lack of instrumental and stylistic variety. That means, personally, it gets 5/5. However, out of deference to the fact that not everyone shares my taste in music, I have to be a little more harsh on it and consider the more artistic stuff that might turn some people off it. So, just because it's damn good, I'm reducing its score to 4.5. Not too bad, eh? Megazone 23 pt. III OST is under copyright of its owner. Any images are the property of their respective rightsholders, and included for review purposes only under the fair-use clause of US copyright law.